The Volvo B10 was a chassis range in continuous development from 1978 until 2001, when it was replaced by low-floor chassis. It was very familiar in its mid-engined manifestation, the B10M. This was used under coaches, mainly, although it also appeared under buses, both single and double deck. It came in a variety of lengths, such as 5.0m, 5.5m, and 6.1m wheelbases, which were denoted in the chassis designation as B10M-50, B10M-55 and B10M-61 respectively. In London it was most apparent as the Volvo Citybus double-decker, used by London General (VC class), Grey Green and its Arriva successors (VA and VE classes), London & Country (and successors), and Boro'Line Maidstone (and successors). These were mostly on B10M-55 chassis, but Grey-Green had some buses on B10M-61 chassis, strangely shortened from 12m coaches. 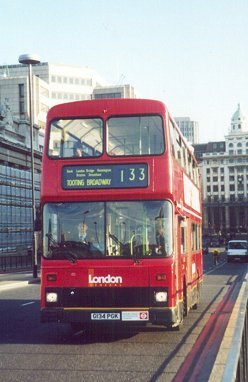 Grey-Green also had single-decker buses on London service, on both B10M-55 and B10M-61 chassis. Seven of the longer buses later went to County Bus. They then moved on to Clchester, but three returned to Arriva the Shires for use in the training fleet. Arriva the Shires also took over in 2000 seven B10Bs with Plaxton Verde bodies from City of Oxford. Arriva also had as at least a dozen B10M-60 or -61s with a variety of coach bodies. Arriva also acquired three Alexander PS buses from Sovereign. Some of Arriva's B10Ms were consigned to the training fleet, including a pair of elderly B58-56s with Duple bodies, from Buffalo. Stagecoach London also had several B10M-60 and -62s with a variety of coach bodies. Harris Bus of Grays had four of the short version, the B9M. One went later to Red Rose, another to Mullany's. The Volvo B10B was a rear-engined single-decker bus chassis, taking over from the B10R from 1992. Arriva the Shires took over a B10B-58 with Alexander Strider bodywork from Buffalo Bus. 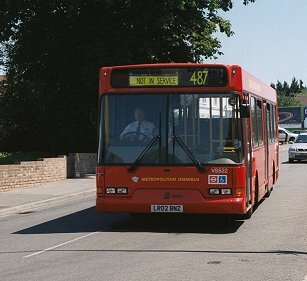 Metrobus of Orpington also took on a pair of secondhand Striders for its long country routes. A low-floor version came from 1993 - the B10BLE, with a short version, the B6LE and B6BLE following on from the B6..